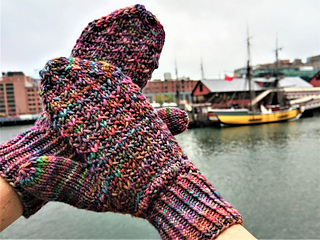 This Beacon Hill Mitts is a quick and easy pattern with a seamless construction. You will find that you can memorize the stitch texture within a couple of repeats! Inspiration for this scarf came from P.B Ryan’s Gilded Age Boston mystery book series that I adore, that centers around the infamous Beacon Hill area. The garter st reminds me of the uneven cobblestone ground, and the hill-like texture is for all of the hills and row houses that make up Beacon Hill. Look for Beacon Hill Infinity Scarf to match the mittens. Yarn: Size S: less than 165 yds/80g of worsted weight wool (recommended: Malabrigo Rios Yarn); Size M: less than 175 yds/85g of yarn; Size L: less than 185yds/90g of yarn. KWNUS (k with needle under strand): insert RH needle under the loose strand, wrap and k the next st, so that the loose strand is now behind that k st.
You will work the mitten in the round starting at the cuff. Every time you come to the BOR marker, slide it. You can find a complete chart for each mitten on the last pg. 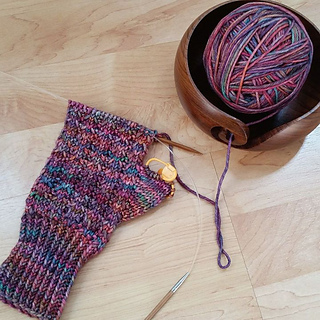 The cuff is knit in a twisted 1x1 rib (k1tbl, p1), which is a signature type of rib of KUAS designs…but feel free to knit using a regular untwisted 1x1 rib.